This post is going to veer a little bit from the norm, because it’s not a review of a restaurant, but a review of a food service. I have reviewed a grocery store before, though, so it’s not all that unusual. Have you heard about Green BEAN Delivery? Basically, it’s a weekly, organic grocery delivery service. Here’s how it works. 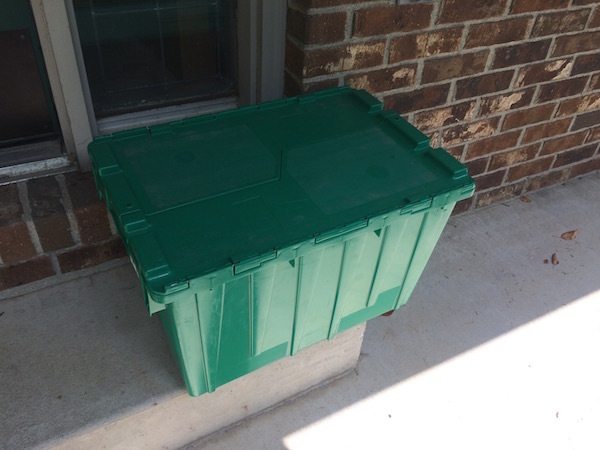 You sign up for an account, then you customize your “bin.” Each week, they will drop off your bin on your front porch, and pick up your old bin. So here’s how it works. You create your account, then login. 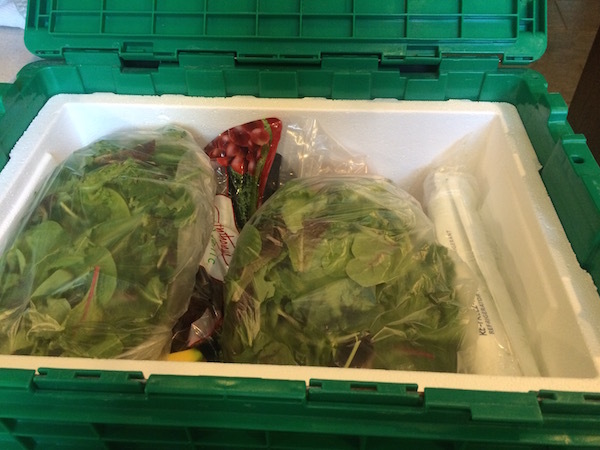 Your bin is preloaded with produce that totals $35. You can remove things from your bin, add to it whatever you want, until you are satisfied. You have until Monday at noon to have what you want specified in your bin. If you don’t, then I assume you get the random assortment that was preloaded. 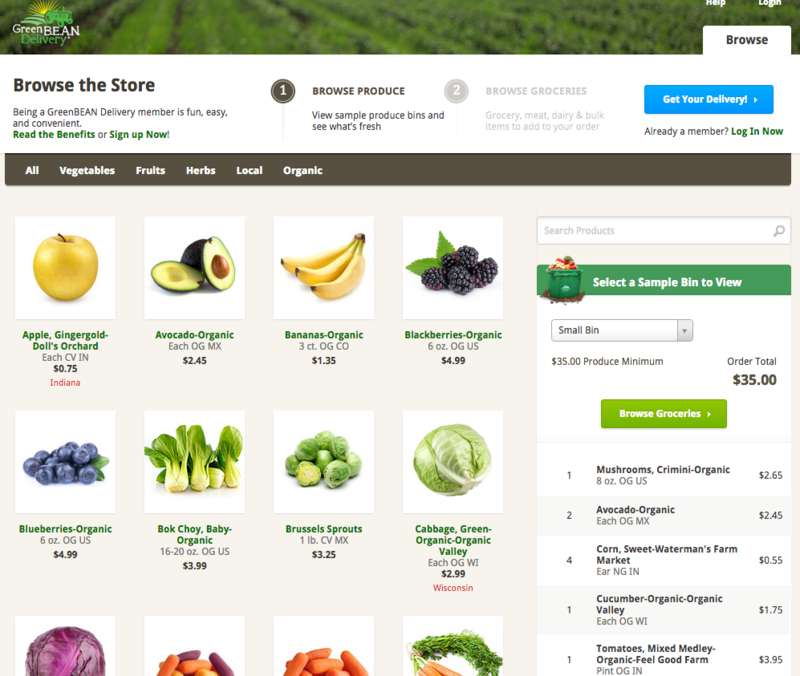 Once you’ve customized your produce, with at least $35 of items, then you have the chance to browse the grocery offerings. They have all kinds of things. Things you can find at the local grocery store, and things you can’t. There’s the whole line of Amy’s Organic and Annie’s items, but you can also find Indiana specific items too, like coffee and granola. They even have meat, butter, fish and eggs sourced from a variety of local farmers. Once you’ve selected any grocery items, you finish your order and you’re done. Then on Wednesday (at least it was Wednesday for me, I don’t know if they have other delivery days in our area) a green bin is left on your porch. I was a bit concerned about the groceries, because I had ordered some meat in addition to my produce. Would it be kept cold? What if I’m not home? No worries though! It was all nicely packed and insulated with an ice pack, and everything was nice in cool. I actually wasn’t home when it was delivered. I carried my bin in and checked it out. Inside it was filled with my produce choices, the meat I’d selected, and a few other grocery items. I was given a $35 credit to try out the service, and I kept the product right at $35 – but I did add on with meat and a few other items, like coffee. I liked being able to shop, order, and have the groceries delivered to my house. I love home delivery! (Delivery is free.) I also liked that most of the items are grown in the midwest and organic. I’ve heard that the company is picky about their produce, so that’s a plus. I really liked how easy it was to customize my bin and make my choices. I could go back and change it as much as I wanted too. This is a subscription service, and it recurs each week. If you have staples that you use every week in your home, you can set those up to be delivered each week, and never run out. I didn’t like that there are really no Lafayette/West Lafayette area vendors. We have a lot of great farms in our surrounding areas, and it would great to start seeing some of their produce arrive in the bins. For this to be a really great concept, and for it to really take off in our area, it’s important that it be competitive. So after my order came, I logged onto the Fresh City Market website to do some price comparisons. If you didn’t know, Fresh City Market (by Purdue) offers free delivery and online shopping, so you can actually shop, choose when to have it delivered, and get it sent right to your door. They do charge a $6.95 service fee. 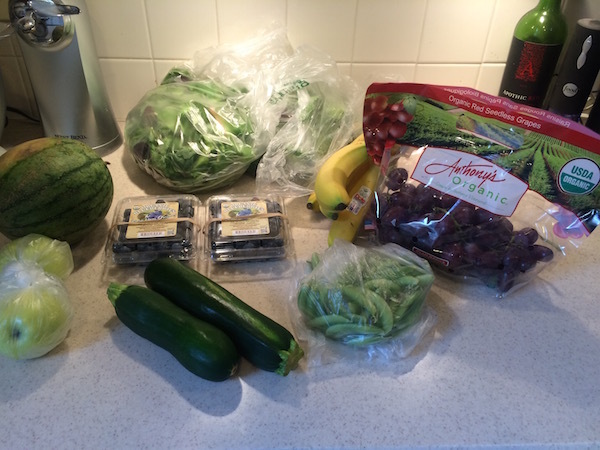 So I went to the Fresh City Market site and added every thing I got from Green BEAN to my shopping cart. And the price was a few dollars higher than what I got from Green BEAN. How does it compare with Kroger or Marsh? I can’t say – they don’t have online shopping, so I can’t really compare unless I go to the store and look, and that’s way too much effort for a review. However, I will say that I am not a fan of produce from some of the bigger box stores, and I’m willing to pay a little extra for higher quality produce grown locally, and the effortlessness of having it delivered is great as well. I didn’t think the prices were unreasonable, but you can see for yourself what I got and what it cost. This is a weekly delivery service. So it does automatically fill your bin each week. You can customize it each week and have until Monday at noon to do so. If you don’t customize it, you get the randomly selected items. I don’t know if that’s random, if there’s a method of what gets put in there or what. You can shop anytime from Thursday at 3PM until Monday at noon. 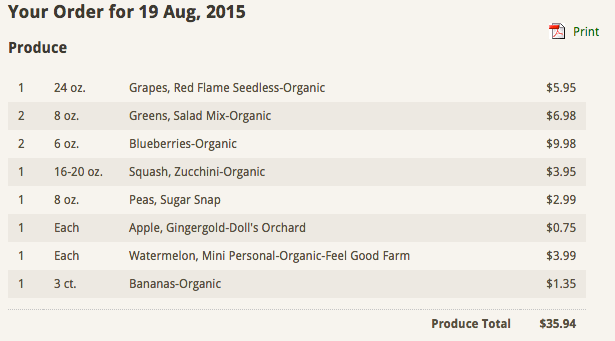 Each week there will be different items available based on what’s currently in season. You can suspend your subscription at any time, for weeks a time. 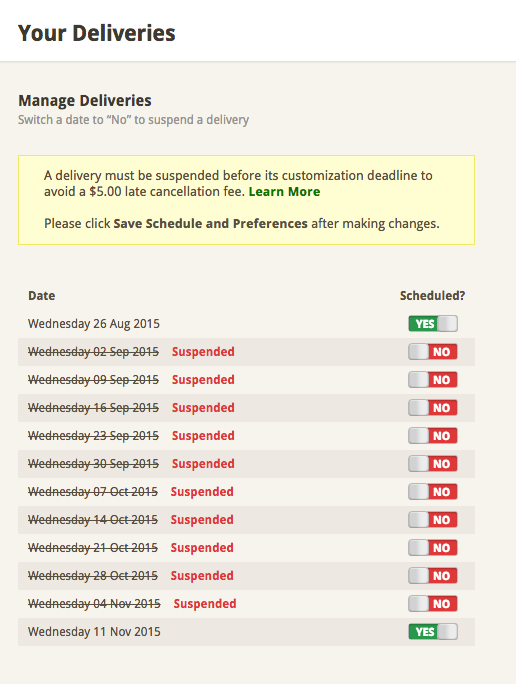 I wasn’t sure how this all worked, so the first time I logged in, I suspended all future deliveries to see how it works. You can also cancel at any time, there is no minimum requirement. Probably. I like Internet shopping, I like produce, and I hate grocery shopping. This is super easy to do, and we do eat a lot of fruits and veggies at our house. So this really works for me. 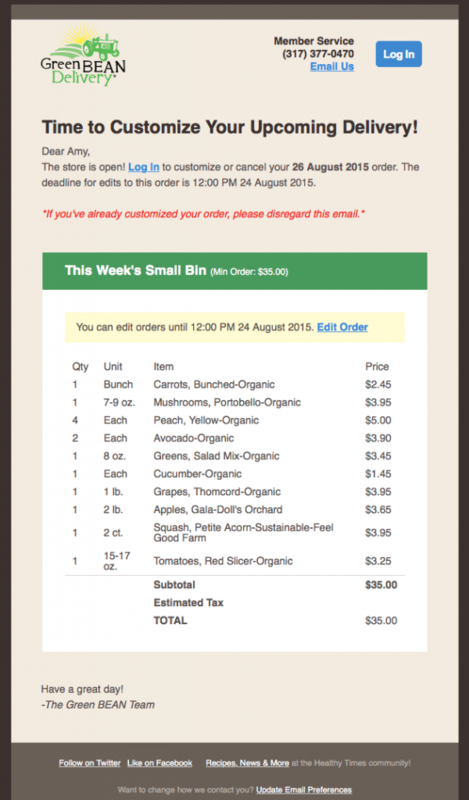 If you would like to try out Green BEAN Delivery, I have a promo code for you! Go to their website, greenbeandelivery.com, and sign up. Use the promo code LFeats for $15 off your first order. Today I received an email from Green BEAN with information about my next bin. I thought I would share it so you can see. It’s got my next bin listed with everything that’s currently in it. From here, I can login, edit what I’m getting, add and remove items, and set up my bin for next week. I’m still a little fuzzy on how the items in my bin get decided each week, but since you can add/remove whatever you want, it’s doesn’t really matter. I was given a $35 credit to try out the service. However, I agreed to do it only with the understanding that the review would be honest, and I’d tell it like it is. All the words in this review are my own.